All hail the laundry room! So long to the days of hauling a laundry basket up and down the basement stairs. The laundry room has become a main artery of the modern home, while usually getting a whole room to itself! Because of this, its design often rivals that of the kitchen or master bathroom. This area is a coveted space of detail, organization and order - giving off a fresh pulse throughout the household for homemakers and CEOs alike. Even if you don’t have space to devote a whole room to your laundering needs, there are some simple ways to turn your appliances into a pretty, functional space. Designer Ursala Carmona turns this walk in pantry to a dually functional space with large pantry cupboards to the left and a small, but mighty, laundry area toward the back. Tile! The crazier and bigger, the better. I love this fun, geometric flooring in designer, Ashley Clark’s SoCal home. It’s a small enough space where you can get away with a shout of WOW without it overtaking a whole room. I also love her simple take on things like the stainless steel wash basin and wood counters - giving the space a really “fresh and so clean, clean” feel. Add in a touch of vintage with some repurposed mail carts, perfect for getting the kids involved in sorting lights and darks, or a cart per family member for easy sorting after drying. I love the comfort of this boho space - with its mix of vintage, plants and textures. The dark cabinets ground the space with a dramatic contrast to the lighter floor tile. The floating shelves add a point of interest and extra storage. Georgia designer, Monica Stewart, suggests foregoing the appliances’ pedestal drawers and lowering them to create more of a usable surface on top, for things like folding and storage, with easy access to the cabinets. Laundry rooms are a great space to incorporate the furry members of the household. 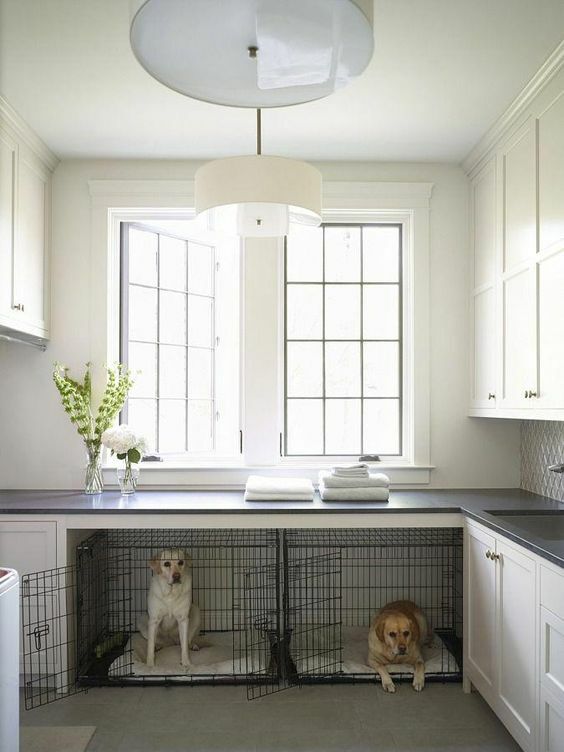 I love the idea of tucking their crates under the counter, out of way and clutter free, giving your pooches a space of their own. Also, food and water bowls - BINGO! How have I never thought to install a tap directly over their bowls?! This is a genius and simple hack to a monotonous chore. Follow this recipe for an easy, foolproof guide to making your own powdered detergent. Step one: Finely grate one bar of Castile soap, set aside. I love Dr. Bronner’s for this! It comes in a bunch of fresh, lovely scents for you to choose. Step two: In a large bowl mix together one box of Arm & Hammer Super Washing Soda and one box of Borax Detergent Booster. Step three: Add in the finely grated soap and mix thoroughly. Then add to storage container. Add two-three tablespoons per load. I usually double the batch to make more at once, but one batch should last up to 5/6 months!